World War One Centennial Battle History Trip to France | Rainbow Division Veterans Memorial Foundation, Inc. In July of 2018, the RDVF hosted a trip to France in honor of the Centennial of World War One and the Rainbow Division. 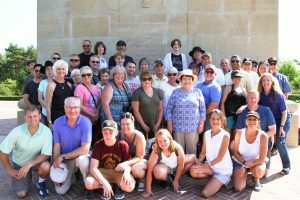 A total of 48 former 42nd Infantry Division veterans, Rainbow Division descendants, families, and friends of the Rainbow spent ten days visiting France’s scenic Verdun, Meuse-Argonne, Champagne, and Chateau-Thierry regions. While in France our group followed in the footsteps of those American “doughboys” who fought there 100 years ago. We also had time to visit the beautiful cities of Reims and Paris. To see images of the places this group visited, click on this link. To see images of the World War One Rainbow Division memorials in France, click here. To see images of the 2018 World War One Centennial ceremonies in which the RDVF participated, click this link.